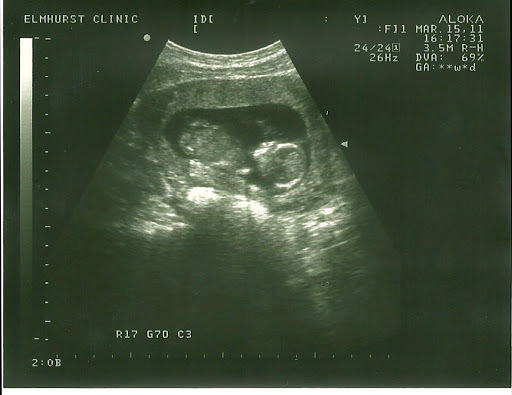 So Jenna and Mark are expecting a baby in September, and when Jenna came and visited me in February, she forgot the ultrasound picture on my fridge. I left it up because I like the idea of having a niece or nephew to spoil rotten and then be able to hand back to Jenna and Mark. Anyways, yesterday the maintenance guy came to my apartment to put a screen door on my little patio doors, and I left him a Ziploc baggy full of Easter candy with a note that said, “Enjoy!!”. When I got back to my apartment last night, he wrote, “Thanks! And congratulations!”. The lady is obviously not a good photographer. We were all squinting in the sun, and Laura was the only one smart enough to just look away (and the only one that can get away with it…). Not that you can SEE that, since the photo is so zoomed OUT. When we were done taking the pictures, Logan must have been sick of being the Easter bunny. I saw this on my drive home from work yesterday. It says “Doom Buggy”. What you can’t see is that it is a hearse. And finally, this picture just makes me laugh. I’m OBVIOUSLY the best actress in the family. So shocking that Tinker Bell actually landed IN Mom’s hands.